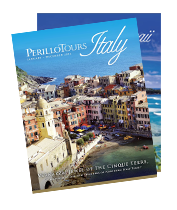 and the FREE Perillo Traveler Magazine in your email! You have been included on our list. Get fully immersed in the flavors of the most famous, traditional products of the region: Parmigiano, Prosciutto and Balsamic Vinegar. You will be picked up at your hotel, then brought to your first stop on this tasting tour - an authentic cheese dairy of Parmigiano-Reggiano to watch how the cheese is freshly made. The next stop is a plant where the world famous Prosciutto is made. The day concludes with a trip to a producer of Balsamic Vinegar in Modena to see how it's made and, of course a tasting. Exact time will be provided in final documents. Pick up at your hotel. Price: Starting at $46.41 pp. Price: Starting at $75.42 pp. Price: Starting at $161.27 pp.